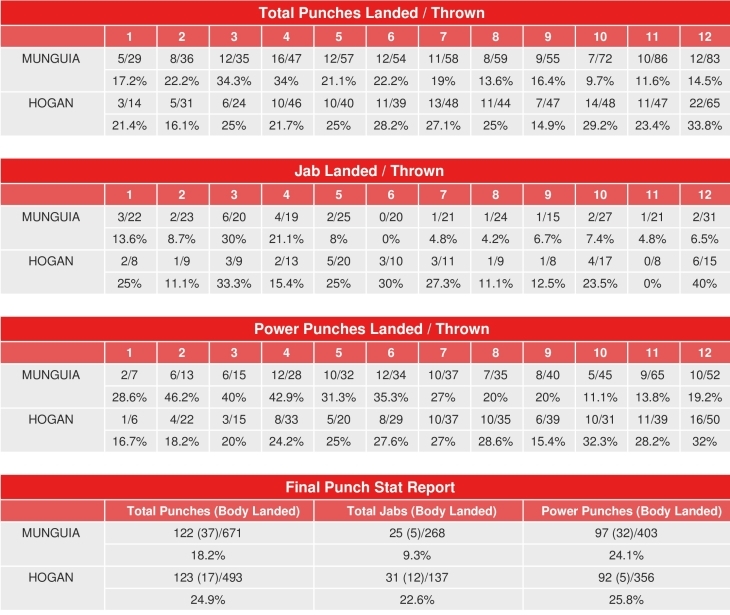 They landed within six punches of each other in 10 of 12 rounds. Uneven performance by Jaime Munguia, looking for the KO all night in front of his hometown fans. Munguia landed an avg. of 10 of 56 punches per round to 10 of 41 for Dennis Hogan, who appeared to land the harder punches all fight. Dennis Hogan described his loss to Jaime Munguia as "bad for boxing" after the Mexican won a controversial majority decision victory in their WBO junior middleweight championship bout. Munguia, who is expected to move up to middleweight and face the likes of Saul "Canelo" Alvarez or Gennady Golovkin, saw off the challenge of Hogan 114-114, 116-112, 115-113 on home soil at Arena Monterrey. But the 22-year-old may consider himself fortunate, with many independent observers feeling Hogan was hard done by. Mounting the fourth defence of his strap, Munguia (33-0) struggled to assert himself against Hogan's nimble footwork during the opening five rounds, before finally bringing his trademark body blows to bear against the 34-year-old Irishman. Undeterred, Hogan held his own and returned fire, even threatening to knock Munguia down with an overhand right in the 11th, while the incumbent had the better of the final round without scoring a decisive blow.